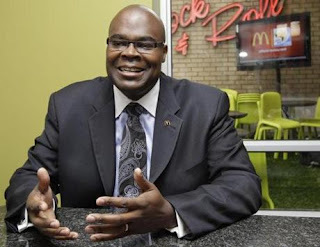 Weighty Matters: Did You Hear the One About the McDonald's CEO Losing Weight Eating McDonald's Everyday? Did You Hear the One About the McDonald's CEO Losing Weight Eating McDonald's Everyday? Yeah, I did too and that's him up above. His 20lbs McDonald's fueled weight loss has been all over the news. But here's the thing. At the end of the day if the bioavailable calories you consume are less than those that you burn you lose. The fact weight can be lost eating at McDonald’s everyday is not news, but the fact that the news is covering it is. What the coverage suggests is that the world still doesn’t understand weight management because if it did there wouldn’t be news stories on the guy who ate fewer calories than he burned and lost weight.